Got loads of yummy coffee pods and nowhere to put them? We have the answer – you can store your coffee capsules in a way that’s easy, neat, and shows them off at their best with our Rotative Metal Capsule Holder. Award-winning Finnish designer Harri Koskinen is the brains behind this stylish Dolce Gusto® accessory, so you can guarantee a little extra chic in your kitchen as well as practicality. Made from iron and stainless steel, this simple and elegant coffee pod holder is a great way to store your Dolce Gusto® pods. 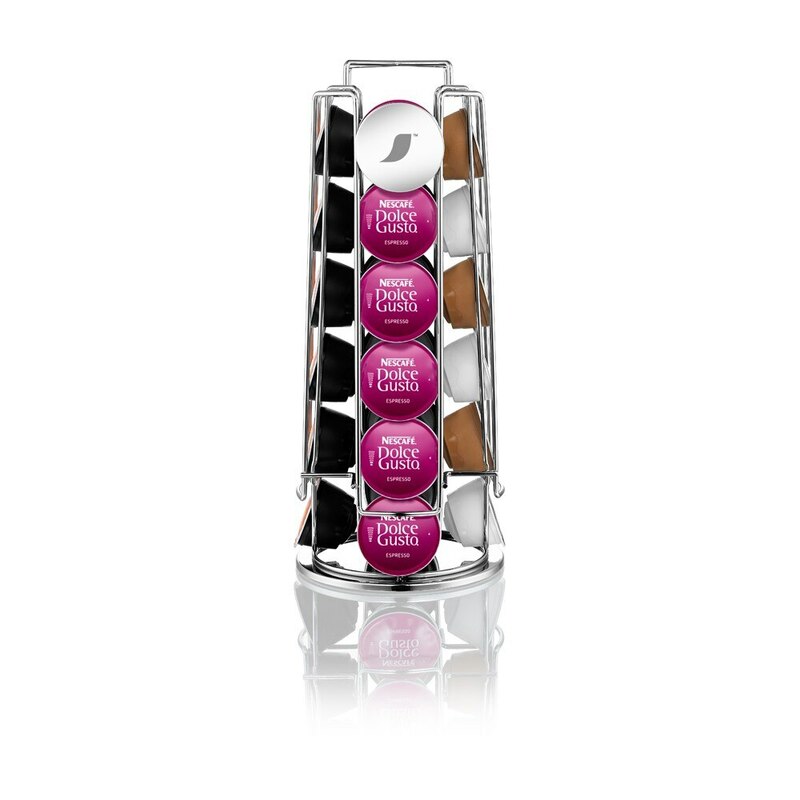 With this coffee capsule holder you’ll always know where your favourite pods are*, as its rotating design means they’re easy to access and choose from. With a base diameter of 142mm and a height of 340mm, it’s just the right size to put on your kitchen counter, but stylish enough to make a real impact. Simplicity is key – its clean design won’t distract from your colourful coffee pods, but it will effortlessly match both modern and traditional kitchens. There are loads of options for organisation – perhaps you could put lungos on one side and cappuccinos on the other, or even dedicate a row to your favourite yummy Chococino®! However you use it, you’ll never be lost with this great accessory. And if you like having different storage options, why not check out our bubble pod holders as well? This is a very expensive item considering that it appears to only hold 24 capsules. 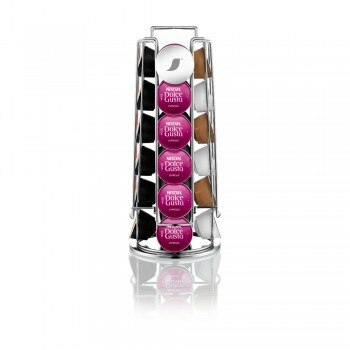 I have just purchased one online, good quality chrome, rotating base, holds 48 capsules. Price £8.99 plus £1.99 delivery. When are Dolce Gusto going to supply reasonable priced accessories for its genuine regular customers? These prices are extremely expensive! I got this holder free with my coffee machine and love it. Its a great product! Having read the reviews above, I would agree it's very expensive..... just wondering why I didn't find the offer when I bought mine! I had this in a promotional pack with the mini me and it looks really good on the worktop. The pods slide easily into the groves and stay safe and secure until you want to remove them from the bottom. I might even buy another as my coffee pod collection is growing and it looks so good! The chrome design and Dolce Gusto logos make this a more attractive item than plastic dispensers. Rotation works well, but the pods sometimes get stuck and need some encouragement to slip all the way down (I sprayed some WD40 on a rag and wiped it on the rails...seems to help!). The price was bearable since I bought it as a present, but wouldn't buy it for myself unless it was about 20% cheaper.